Its a funny old world when your tipsy but not drunk . . .
No I am not sat on my veranda quaffing copious amounts of a nice dessert wine . . . well I might be, but thats besides the point! Joan S wrote to David asking for a recipe for pound cake. Brian P from Canada wrote asking me if I had ever heard of drunk cake. Mal O meanwhile emailed me looking for the answer to a crossword puzzle . . . the answer was not drunk cake as I thought it might have been, but tipsy cake. After Mal emailed me back after finding the answer to the last one, I get another email asking me for a recipe for Tipsy Cake! For those of you that have managed to follow the plot so far and are wondering . . . yeah, but what about the pound cake? Well, tipsy cake is made from a stale pound cake! What is it out there with everyone? Is there a party going on that they have failed to invite me to . . . or is this just Mr Fate, just having a bit of a giggle at my expense? Not to mention of course David saying last week he could use some more sweet recipes. Hmmmmm I thought to myself, looks like I have this weeks cooking column sorted out if nothing else. This week then, I am going to give you the recipe for pound cake plus the instructions for making tipsy cake . . . but wait theres more! Next weeks column will be a follow up article on how to make Drunk Cake or as they call it in the original Mexican / Spanish Bolo Bjbado. 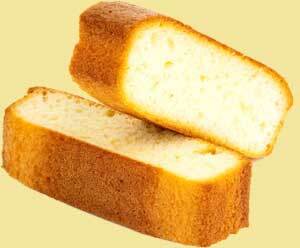 Why pound cake? It was named originally because this cake was made with one pound (as in the old imperial measurement) each of flour, butter, eggs, and sugar, creating a dense, moist loaf. In this recipe, I use some grated lemon rind for added flavour and some baking powder to aid in the leavening. I once had a trainee chef ask me what in the recipe I had given him, were oozes? Confused I looked at it, and then it dawned on me he meant ounces! The variations on this cake are endless and the history of it even more so. Every country it would seem has its own variation on the theme. For mine, I have based it on the oldest version of it I could find on researching it; circa 1745 and it is not so much a cake as we know it today, but more like a version of the English trifle. Tipsy cake, it would seem, as with trifle was designed for using up any stale pound cake. The only recipe that is needed is the one above for pound cake, after that it is very much a case of using the ingredients to taste. When making crème Anglaise with fresh vanilla it is also nice to leave the vanilla seeds in; it leaves an attractive finish to the ice cream and shows the customers that fresh vanilla was used. However this is a personal choice. When using a Crème Anglaise as a sauce it can be made thicker by replacing half the milk with cream. Crème Anglaise can also be used as a base for other dishes. Such as bavarois, ice creams and some types of parfaits. To this basic sauce can be added endless essences and flavourings (when boiling milk) to make other sauces.